So far, I have reviewed some gear that I thought was affordable for the average player out there. And those items are great for anybody, but today I want to review an upper end guitar for those that like the finer things. 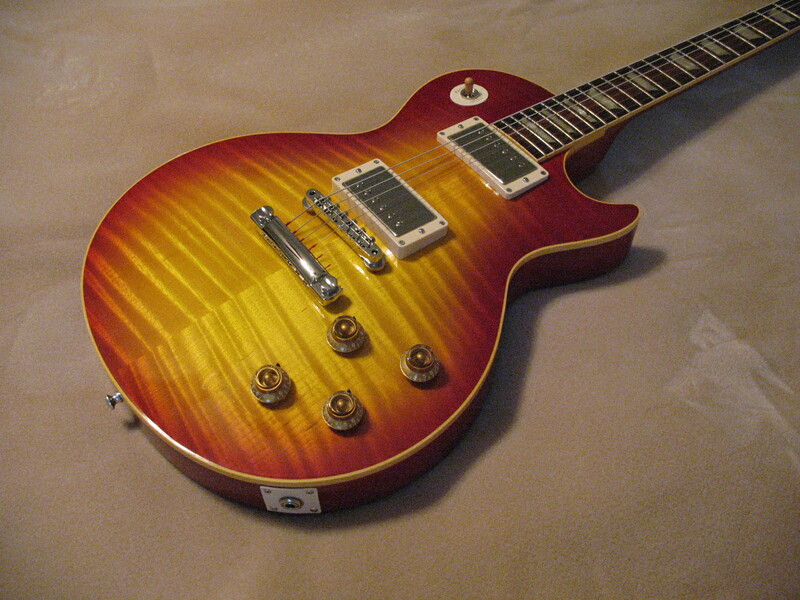 Today I’m going to tell you about the Gibson Custom Shop 1959 Les Paul Reissue Gloss model. I had wanted one of these for the longest time. 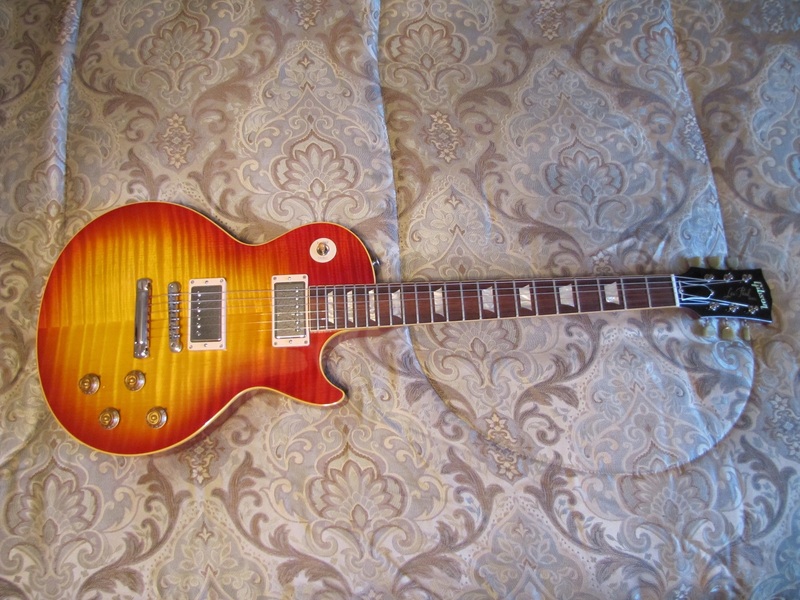 I had a 1974 Gibson Les Paul Standard with special order big Humbucking pickups I had owned for awhile. I was starting to finally feel the need to let that one go, so I traded it in to my favorite Guitar Center store in Tulsa, OK. 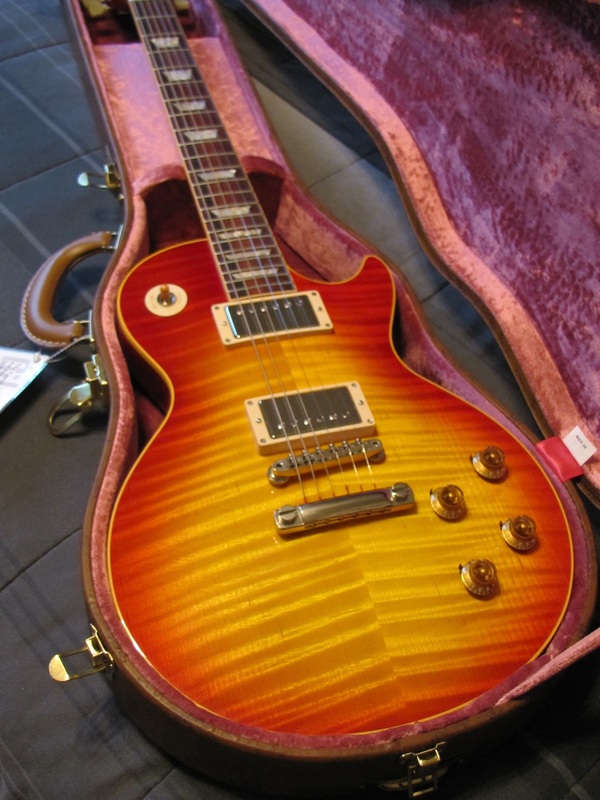 I originally ordered a Gibson Les Paul Standard with AAA maple top in heritage cherry sunburst, but it was unavailable at the time, so I ordered the Gibson Les Paul Standard 50’s neck model. Now this guitar was ok, but there was a black spot in the wood by the cutaway that bothered me. Also, I found out Gibson was chambering the bodies to make the guitar lighter. I am a traditionalist and wanted my Les Paul to be like they used to make them. So in order to do that, I stepped up and ordered the Custom Shop model. At that time, this guitar was selling for $5,499.00. Lucky thing for me, Guitar Center had a 10% coupon at the time, and I took full advantage of that. 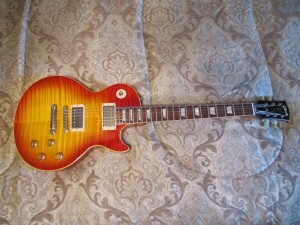 Ironically, Gibson raised the price by $500.00 two weeks later after I had purchased mine, to $5,999.00. Great timing for me. I ordered the guitar on 06/27/08, and drove to Tulsa on 07/10/08 to pick it up. Now the guys at Guitar Center know that I want to be the first one to open the box of a new guitar purchase, so as I pulled the staples loose and slid the case out of the packing box, my heart was racing, and I was praying this guitar would have that perfect flame maple top. As I opened the brown vintage style Les Paul case with pink lining, I was stunned as to how amazing this guitar looked. I was in heaven! God answered my prayer! Even the Guitar Center sales guys were in awe of this guitar. I got the washed cherry finish in gloss, which means it’s finished in a glossy, shiny finish, instead of a dull or flat finish like the VOS (Vintage Old Stock) finish is. This guitar had a stunning flame maple top. The mahogany had a very nice tight grain on the back and neck. The rosewood fretboard had a beautiful rich color. The case is right out of the fifties with vintage brown covering and a cool pink lining inside. This guitar weighed 9.5 lbs., compared to 7.5 lbs. the regular Les Paul Standard I traded back in for this one. I did not personally want a chambered body. I wanted this guitar to be every bit like the old original ones, and with the ‘59, you get it hands down. Standing side by side, this ‘59 Les Paul blew away the regular cherry sunburst that I had. You will truly appreciate the hands on craftsmanship of a Custom Shop made guitar verses a standard production model guitar. The neck is the bigger fifties style I like. The hardware was very nice and done in nickel. The binding has an aged look that gives it that vintage look. The pickups in this guitar are truly amazing. They are a Burstbucker 1 (rhythm) and Burstbucker 2 (treble). These are loud and clean. Gibson uses the old style CTS pots and bumblebee capacitors. An aluminum stop bar tailpiece for vintage sustain, original style toggle switch washer and jack plate. Vintage tulip style tuners, carved maple top, solid mahogany back, one piece mahogany neck with original style truss rod routing and 1959 rounded neck. 22 fret rosewood fretboard with historically accurate trapezoid inlays. If you can swing it, you absolutely have to get one. When you open that case for the first time and look in, you will know what I’m talking about. You definitely get what you pay for here. Out of 16 guitars I own, this one is my prized possession!